Believe it or not computers weren’t even invented when some of us reached the age of needing reading glasses! But now that everyone uses computers on a regular basis, often combining dual screens and multiple technologies with text reading and screen work a new problem has emerged. If you wear your reading glasses for the computer you will find that you have to move unnaturally close over time and this gives you neck ache and backache. 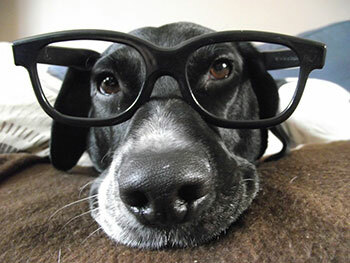 If you require glasses for looking in the distance as you get older, you will require a different pair for reading. In many jobs it is impractical to keep swapping between two pairs of glasses. Bi-focals are one solution, giving clear distance and near vision in one lens. Unfortunately however, they are not ideally suited to the desktop computer, which is mid-distance and at eye level. You have to tilt your head right back to look through the reading portion and lean forward to a distance more suited to reading. You may also have to move your head from side to side to see the entire screen. This is why you very quickly begin to suffer both back ache and neck ache. Vocational progressive lenses have been designed to overcome these problems. The top portion of these lenses is focuses at a computer distance giving a wide area of clear vision for viewing the screen. The bottom portion focuses at a closer distance for reading. Purpose designed occupational lenses will allow you to work on the computer more comfortably from a visual perspective, as well as improving posture, reducing back ache and headaches. We’ll help you decide what the best lenses are for you.